This summer I had the opportunity to work with four amazingly talented women, who all helped and supported me in creating a fabulous floral vision of mine. It all came about when I met Susie Leverick of Leverick Flowers through my networking group Athena. Susie is a creative florist with an eye for style and the unexpected, you may recognize her name from when I worked with her here. 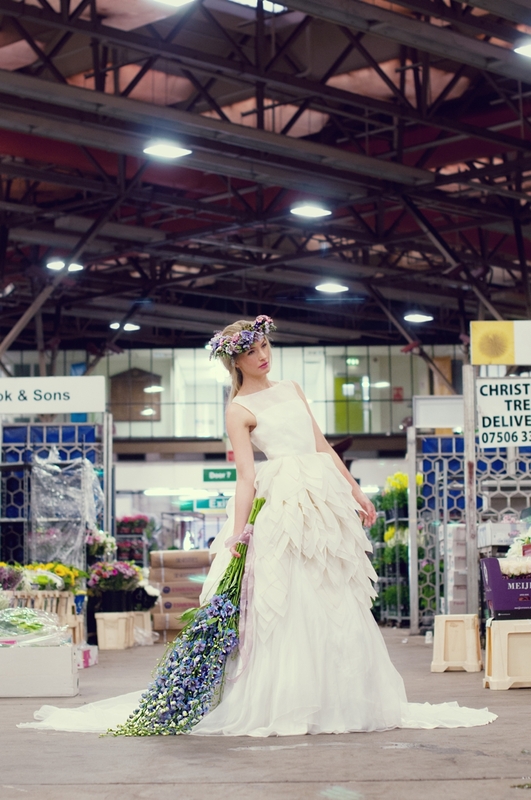 For some time now I have been wanting to create a floral themed bridal shoot, so you can imagine my delight when I found out that Susie not only has access to a unit at New Covent Garden Flower Market, which I would consider to be floral Mecca, but she also has a great working relationship with the market’s staff and traders. Susie kindly gained us permission to shoot at the market and the support of the traders who allowed us to work in and around their stalls. We wanted the shoot to combine elegance, luxury and style which would all be represented through the bridal wear and flowers. This would then be juxtaposed against the industrial market surroundings, giving the overall shoot an editorial feel to it. However, Susie knew she did not want the flowers to be your typical wedding flower arrangements. She wanted to create floral accessories such as headpieces, belts and cuffs that would not only show off her amazing skills and creativity, but also demonstrate that as a bride you do not have to stick with the traditional bouquet. Susie had visions of a wall of delphiniums, the best of British countryside foliage, flora and fauna as well as exotic orchids in purples and contrasting limes. By this point I knew I wanted to work with a wedding dress designer who’s creations would complement Susie’s floral accessories, but also stand out against the market backdrop. The dresses would need to be modern, feminine, elegant, yet bold. Elizabeth Stuart wedding dresses are all of things and so much more therefore the perfect choice. What I personally love the most about Elizabeth’s designs are their fairytale silhouettes and beautiful use of quality fabric, giving them this tactile element which I simply adore. We then joined forces with awarding winning make-up artist Kristina Gasperas and our stunning model Lara Raybone. Both Kristina and Lara went above and beyond their duties that day, adapting and pushing themselves to give the best possible results, for which I am very grateful. A big thank you to New Covent Garden Flower Market and all their very accommodating traders. All images retouched by Kathleen Smerdon.